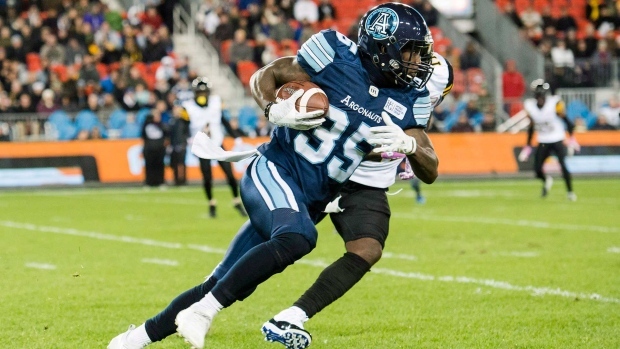 TORONTO - The Toronto Argonauts re-signed American running back Brandon Burks to a contract extension through the 2020 season Monday. The five-foot-nine, 208-pound Burks was scheduled to become a free agent Feb. 12. Burks ran 45 times for 283 yards over eight games last season with Toronto. He joined the Argos after spending the 2016 season with the Green Bay Packers and New York Jets, playing in one game for the latter as a rookie. Burks played collegiately at Troy University, moving from receiver to running back in his sophomore season. He played in 45 games, rushing for 2,253 yards and 12 touchdowns while adding 88 catches for 673 yards and three TDs. The Calgary Stampeders have signed American linebacker Dwayne Norman. The Duke product originally signed with the team in 2017 and played one game in 2018 before being released. Overall, Norman has played four regular-season games with Calgary. Norman played safety for his first three seasons at Duke before making the switch to linebacker and receiving a third-team all-conference selection. The B.C. Lions have signed Canadian running back Wayne Moore to a contract extension through 2020. Originally drafted by the Montreal Alouettes in 2016, Moore joined the Lions as a free agent in July and appeared in 13 regular-season games in 2018. The Toronto native saw action primarily on special teams, where he registered 11 tackles. “Wayne was a valuable pick-up for us last season and we're looking forward to seeing him continue his development,” GM Ed Hervey said in a statement. The Winnipeg Blue Bombers have signed American defensive lineman Noble Nwachukwu. The West Virginia product spent time on the San Francisco 49ers practice roster in 2017.